First, full disclosure: I know a few of the team at ThinkTankPhoto and I really like them, they’re a really nice group of people. So you may think it’s because I really like the people that I like their bags so much. Except I really like my dentist but I don’t like what he does to me every six months for my check up. I suppose this is my way of saying that I can be objective even though I am reviewing something that is made by people that I like. Now that that is out of the way, let’s talk about camera roller bags. I’ve had the ThinkTankPhoto Airport Roller Derby for about four years now and it is still almost my most used camera bags. I have a lot of camera bags, so that’s saying a lot. It’s about the biggest bag you can get away with as a carry-on that I’ve found. I’ve tried using bags that are slightly bigger and I’ve been gate checked with those at least once or twice. I’ve never been gate checked with the Airport Roller Derby. So what can I fit into it? Oh my word, what can’t I fit into it? It has enough space to fit in two camera bodies, or as I use it, a Sony Fs5(though the image below is my Fs7), as well as three to four lenses and batteries. You then also have a really decent size front pocket. 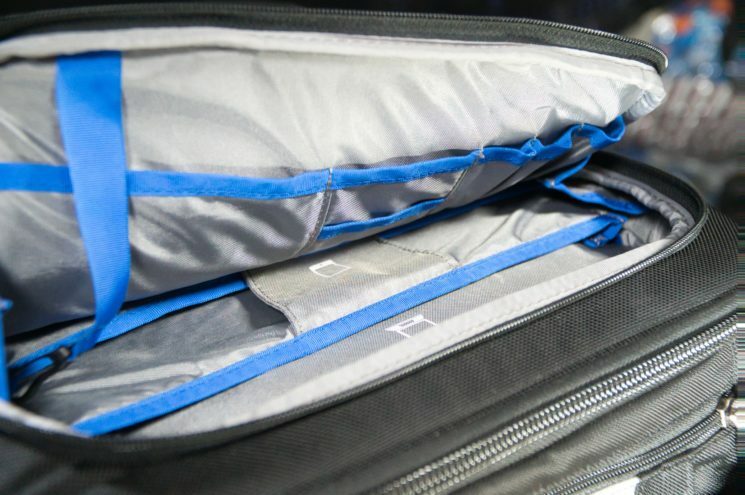 It’s got a padded sleeve for a 15-inch laptop and another non-padded pocket in front of that for a 10-inch tablet. You’ve also got a bunch of little pockets in there for things like pens and or adapters and such. There are two external, small zipped pockets that could be used for memory cards, business cards and pens or anything thin. There’s also a cable and lock pocket that you can use to attach the bag to something if for some reason you need to walk away from it. Though I generally just use this pocket to hold my keys when I am traveling. 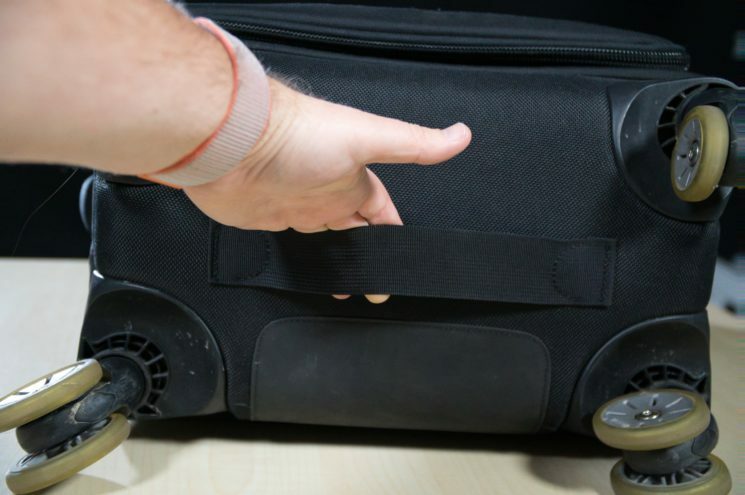 It also has a really strong extendable handle that can also be zipped up to make the bag neat and tidy when the handle isn’t needed. Even with all that, the feature that makes this bag stand out for me is the four, instead of two, wheels that the bag has. It seems like a small thing, but having four wheels means that the bag is much easier to get around on smooth surfaces. It means you can gently push it, instead of having to drag it behind you. It also means you can “playfully” spin it around, when you’re bored or want to try and make airline staff think it’s really light. Finally, this also allows you to pretend you’re part of the Canadian curling team while on a long layover by pushing it lightly as a colleague pretends to sweep the floor in front of the bag as it slides along. FYI, it has a really bad swing to the right. My one little negative about the bag is that the pouch on the side for holding the bottom of your tripod is a bit small. I know this is designed for photography tripods that are smaller than video tripods, but it would be nice if they put in a bit more material to make the pouch bigger so that you could fit in a larger tripod. The last feature I want to mention is not really a feature specific to this bag, but one that I find in all ThinkTank bags, and that is that it has a material handle on the bottom. This means it has a handle on pretty much every side, which in turn means that no matter how you are picking the bag up, you’ve always got a handle you can use. It’s small details like this that I really like about it. To give you an idea of just how many different planes I’ve taken this bag on and never had any issues of being asked to gate check it. This bag has come with me on trips to New Zealand, Canada, the USA, the Galapagos Islands, Fiji, Hong Kong, Israel and all over Australia. It’s been on ten different airlines and even though I try and avoid budget airlines, I’ve even taken it on a Jetstar flight once (I didn’t book that one as “friends don’t let friends fly Jetstar”) and even then had no issues. I’ve taken it on planes that range from a A380 all the way down to a Dash 8. For those who aren’t familiar with the Dash 8, it’s not a large aircraft. It’s one of those propellor units where you really wonder why they even have a flight attendant. I know I am going on a fair bit about this whole “getting it on a plane” thing but that is one of the biggest stresses I have when traveling with gear. My gear is not cheap and I pride myself on taking really good care of it. I don’t think the airlines take as much pride in protecting my gear as I do. So I never want to check in a bag with cameras or lenses in them. So it’s important for me to be able to take that gear along with me in the cabin. Having said all that, it’s also a really useful bag when not using it for air travel. It’s big enough on the inside to get a whole bunch of things in it – as much as a two camera setup as well as your laptop, tablet and a few hard drives, so pretty much all the sensitive bits you need for a remote shoot. Then it looks small enough on the outside that most people wouldn’t suspect how much you’ve managed to fit in it. And finally, it’s really well made. Even after four years of heavy use and thousands of kilometres of travel, it’s looks almost as good as the day I unpacked it from it’s shipping box. Definitely a good purchase then!